I have in possession a battered old leather-bound notebook. In the front page is lady’s name and the date – 1886. It is a collection of hand-written recipes from England. Many of these recipes were given to her. Some are marked ‘Mother’, others are from ‘Alice A’, ‘Sissie’ and ‘Florrie’ amongst other contributors. I’m working my way through it and it can be tricky because ‘Mother’ or ‘Florrie’ assumes that we know how to make cakes so just lists the ingredients, thinking that we know what to do with them. Some are written in very faded pencil and others were obviously written hurriedly, making many difficult to read. Temperature and quantities are sometimes assumed too such as ‘a good sized turnip’ or a ‘quick oven’. I’ll be sharing them with you as and when I decipher them. Here’s the first. Please see my notes in italics. Note: The apples should be peeled and cored. ‘Breadcrumbs’ does not refer to anything out of a packet but literally crumbed bread. 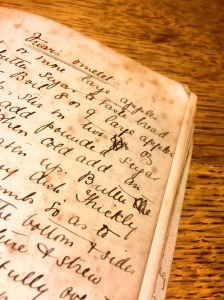 Boil eight or nine apples to a pulp. Stir in two ounces of butter, add powdered sugar to taste. Strain, then add an egg well beaten up. Thickly strew breadcrumbs so as to stick allover the bottom and sides. Put in the mixture and strew breadcrumbs plentifully over the top. Put into a moderate oven and when baked turn it out and put powdered sugar over it. In fact, no-one is attributed with supplying this recipe but underneath it is the legend ‘(Very good)’.